Chain Fruit Cholla are a large tree-like cactus which grows to a height of 12 feet or more. It derives its name from the fact that each years fruit form on that of the previous year, thus the length of the fruit chain increases each year. The cactus grows at elevations from 1000 - 3000 feet and prefers sandy desert soils of lower bajadas and valleys. In the summer, the cholla blooms with small pink flowers. Chain Fruit Cholla are pollinated by bees, however, they more commonly reproduce when fruit segments drop to the ground and form roots, starting a new plant. Because of this short dispersal distance, the cholla often form dense colonies of clonal plants. The Chain Fruit Cholla is also known as the jumping cholla. It gets its name from the prickly, segmented stalks which seem to attach themselves so easily to objects, that people thought they actually jumped off the plant. 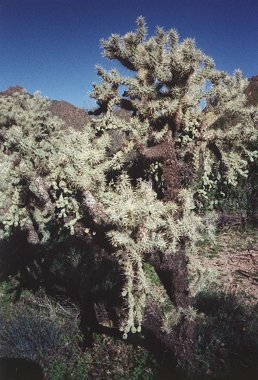 Chain Fruit Cholla provide shelter for several animals including pack rats, which often dig a nest at the base of the plant, then cover the entrance with cholla segments for protection, and the cactus wren, which prefer to build their nests among the stems of the cholla. Fruits are eaten by birds and animals. Native Americans ate the cholla buds, which contain significant protein and calcium.